What you can do from Ireland against the Muslim ban. On 27th of January Donald Trump signed the executive order called “Protecting the nation from foreign terrorist entry into the United States” commonly known as ‘Muslim ban’. As a result America’s refugees programme has been suspended for four months and Syrian refugees completely barred from entering the US. Additionally the order denies entering or returning to America, for at least 90 days, to anyone from seven Muslim countries: Iran, Iraq, Libya, Somalia, Sudan, Syria and Yemen. Write to your TD in relation to the application of the Executive Order in US pre-clearance in Irish airports. The order is particularly momentous for Ireland, which hosts the only US pre-clearance immigration facilities anywhere in Europe. Write to Irish Human Rights and Equality Commission in relation to the US pre-clearance in Irish airports. Sign the petition calling for Taoiseach Enda Kenny to boycott the annual St Patrick’s Day visit to meet US president Trump in Washington. Send Oxfam’s email to Taoiseach Enda Kenny urging him to speak for the rights of refugees. Dublin, 2nd February, 6pm: Attend the United Against Racism​’s Emergency Picket: No to Trump’s Travel Ban on Muslims & Refugees. Galway, 2nd February, 7pm: Attend Solidarity Rally: Oppose Trump’s Islamophobic Travel Ban. Shannon, 2nd February, 6pm: Attend demo at Shannon Airport, where pre-clearance for the US happens. 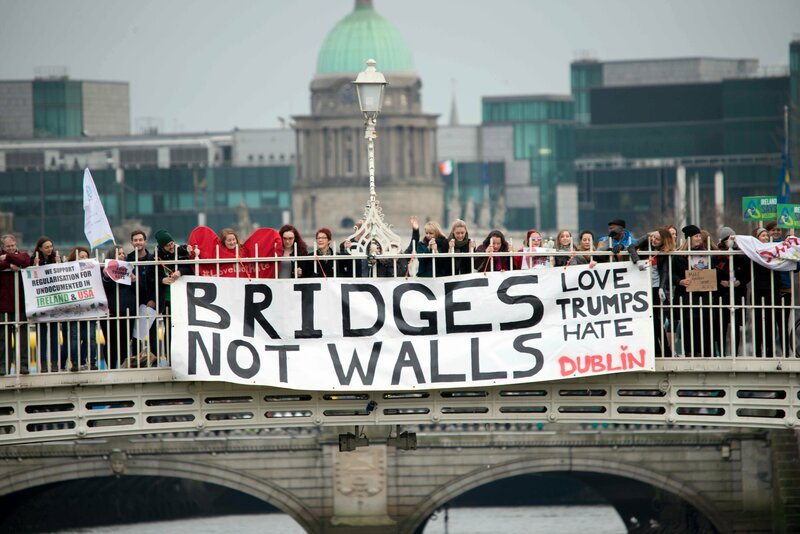 Check our Solidarity with Refugees: 10 Things You Can Do to Help in Ireland blog post for more ideas how you can support refugees in and from Ireland. Please share to spread the word! We can’t allow this hateful agenda to become the new normal. Check this page for updates and email aga@enarireland.org if you would like your action listed here. Use the following hastags: #nobannowall #MuslimBan #noban #trump #lovenothate #bridgesnotwalls while sharing this post.